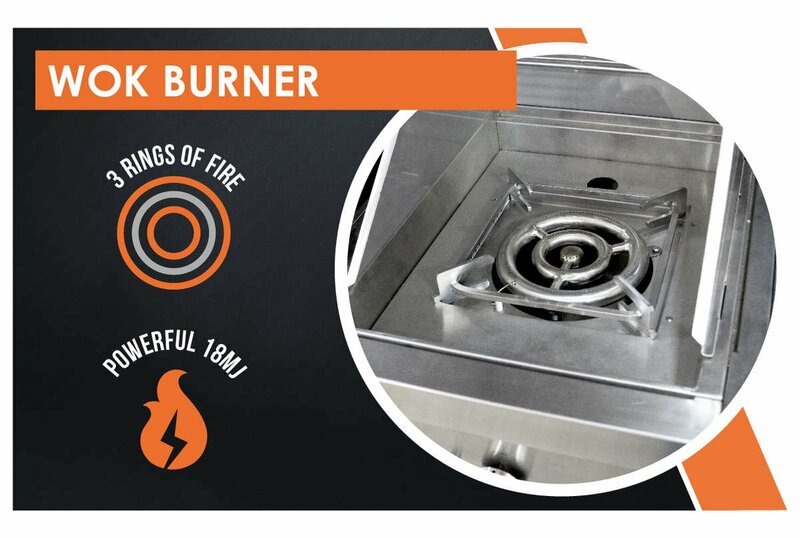 The heart of the R Class BBQ is our new exclusive H pattern dual stainless steel burner. This 17 MJ/h burner has been developed specifically for the R Class. 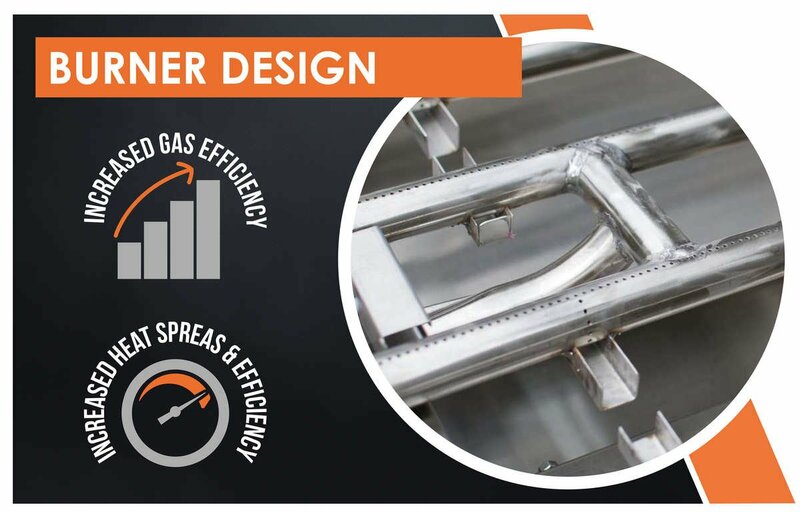 The burner ports on the H burners are positioned vertically on top of the burner tubes increasing efficiencies. Compared to our previous flagship range, the S Class, we increased heat output significantly using less gas and reducing emissions by over 20%. The H pattern design spreads heat more evenly across the entire cooking surface virtually eliminating cold spots. The top port design also helps in reducing heat fatigue on the burners increasing their life span. By contrast most BBQs use burner technology designed decades ago - inefficiently thirsty on the gas, have poor heat distribution and a limited life span. The R Class comes standard with a double skinned firebox. Our built in models includes our heat insulation blanket so you can build the unit into all kinds of materials not just non combustibles like brick and granite that the naked GTR & Horizon BBQ are restricted to. You can have peace of mind and build straight into your kitchen cabinetry without worry. 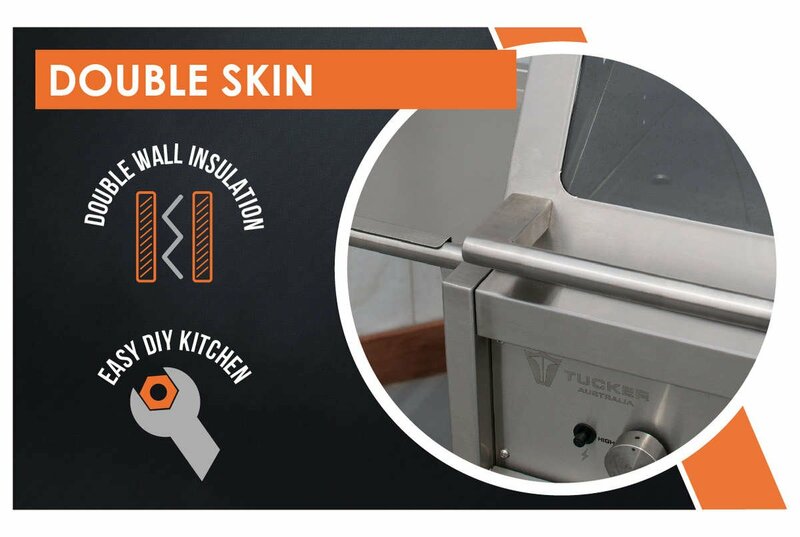 Our R Class BBQs on Cabinets can be retro fitted into an outdoor kitchen simply by adding the insulation blanket (purchased separately). Fat collection has never been easier. The concealed cassette tray is hidden under our R Class premium fascia. Simply lift fascia and slide out the slimline tray to wash. The firebox gradient allows all excess fat to simply collect in the tray submerged in the centre of the unit. The tray doesn't require lining with sand or foil making it a breeze to clean under water or in the dishwasher. 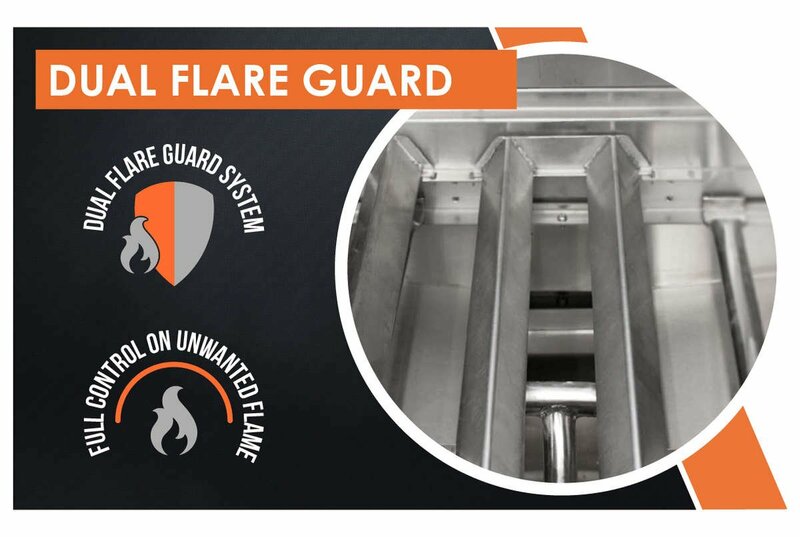 The dual Flare Guards are positioned directly above each burner beneath the open grill section of the BBQ. 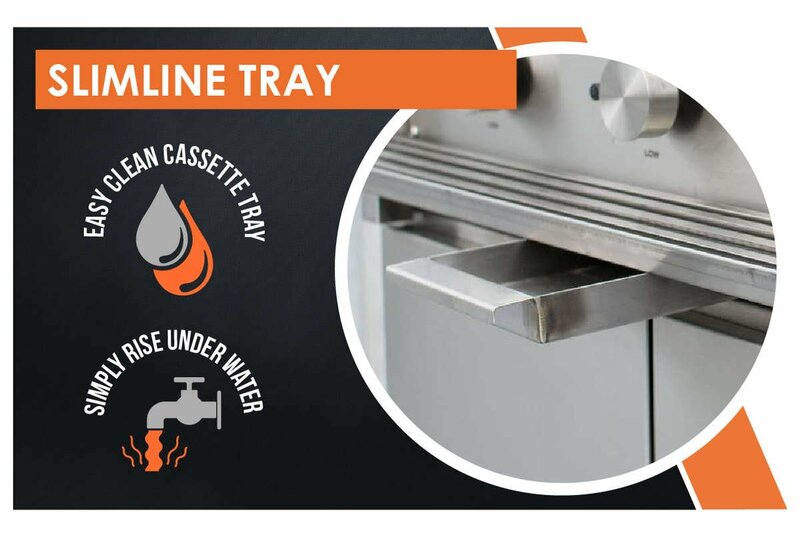 This system protects the burners from unwanted spills as well as gives you full control of unwanted flare caused by excess oils coming from your meat or marinade. Heat is spread more efficiently across the grill section of your BBQ. During cooking if unwanted flare should occur, simply turn the burner down beneath the flare and you will see the flame reduced in seconds. The R Class Window Roasting hood is available both for the R Class BBQ and for the 3 Ring Wok Burner. 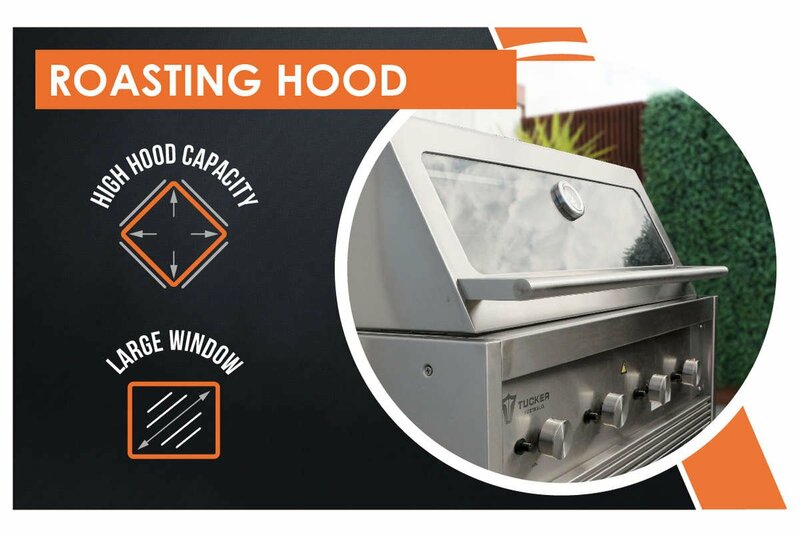 Hoods feature self rolling design so no extra clearance is needed behind the unit. The wide angle viewing window lets you cook like a pro. The elevated back cooking rack gives you more capacity to cook. The roasting hood for BBQ comes with our Tucker roast pan and rack for superior roasts. And, of course, all R Class hoods are compatible with our Tucker Rotisserie Kits. Our GT & GTR range use Aluminium Cast knobs which are low maintenance and don't corrode. They can, however, oxide with salt water exposure if they are not wiped down occasionally with water. In our R Class we have upgraded our knob system to 304 Stainless Steel for an even stronger build and strong gas valve control. 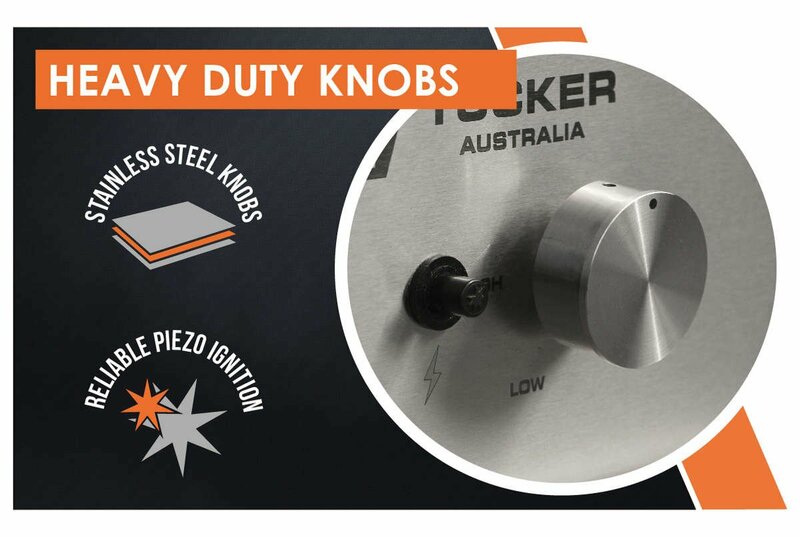 The Tucker piezo ignition system is found on each burner and requires no batteries or electricity making them highly reliable. The optional 3 ring wok burner provides enough heat to roast (with optional wok hood) and has an incredible 18 megajoules of heat for pan frying, stir frying and wok cooking. Smart easy lift hinged lid included, optional roasting window hood available. Now you can cook on your BBQ and roast over your side burner at the same time! The R Class will be the best BBQ you've ever owned. We ship Australia wide and offer assembly aross the Sydney metro area. Talk to our BBQ experts today - 1300 300 227.